Walking from Centenary Square towards the brutalist inverted pyramid that was until recently Birmingham Library you’ll see two black glass buildings flanking the walkway. On the left side is the Copthorne Hotel, which contains Bugis Street Brasserie – named after the well known Singaporean street food haven. 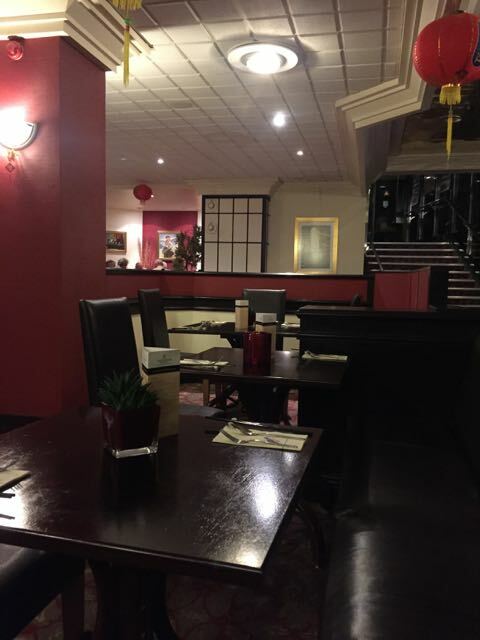 I’ve been to another branch of this Asian eatery in the Millennium Gloucester hotel, and that was excellent (it was swanky, there was a harpist in the hotel lobby), so I was expecting good things. Both the restaurant and hotel lobby are in a bit of a timewarp it would appear, it could really all do with a makeover to drag it out of the 90s. The restaurant is divided from the hotel lounge by some low walls with planting, which do little to separate the hubbub of the lounge from diners. Our dinner was accompanied by screeching children, and worse still, a drunk vagrant who twice staggered through the hotel lounge shouting at people without any sign of resistance from the staff – I guess from that this is a normal occurrence. Not at all relaxing. The service was slapdash. It took twenty minutes to get a beer and a menu. At one point there were four staff stood around chatting for ten minutes about the next day’s roster while we sat beer-less. Finally we were served by a very pleasant waiter, who had a hard time understanding us. 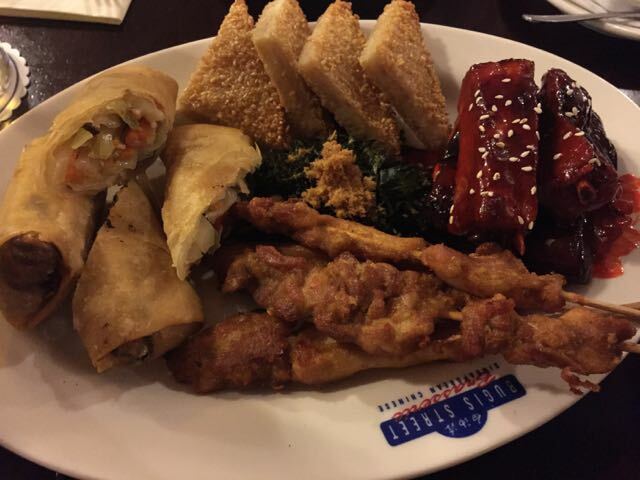 For starters we tried a mixed platter (£17 for two people) which included ribs, satay chicken, sesame prawn toast and tasty spring rolls. Our starters were delayed as chef had to whip up some more spring rolls because they’d run out, they were probably the best part of the whole meal. The mains were a bit of a sorry story. 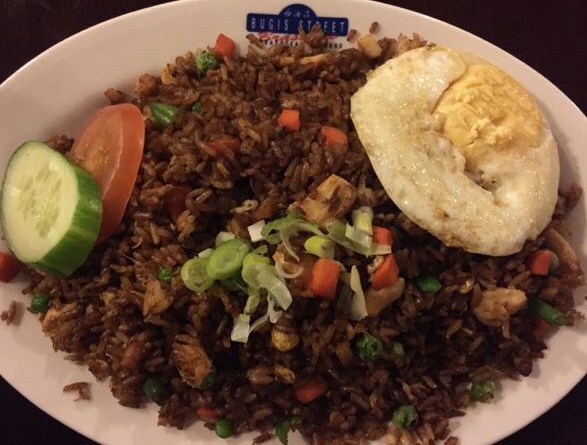 We ordered the Nasi Goreng (£7.25), a spicy rice dish with chicken, shrimp, and vegetables with a fried egg on top. There’s a picture of this dish on a lot of their marketing and it always looks tempting. It was however thoroughly disappointing. The fried egg was hard and the rice greasy and bland. We also had the Kung Po Chicken (£8.25), also bland, and with chicken that was chewy and hard, utterly overcooked. I fear hotel patrons won’t realise that just over the walkway, twenty paces from the hotel, is the lovely Woktastic that serves fresh and tasty Asian cuisine. Poor service, unpleasant food, in a hotel lounge. We won’t be back. 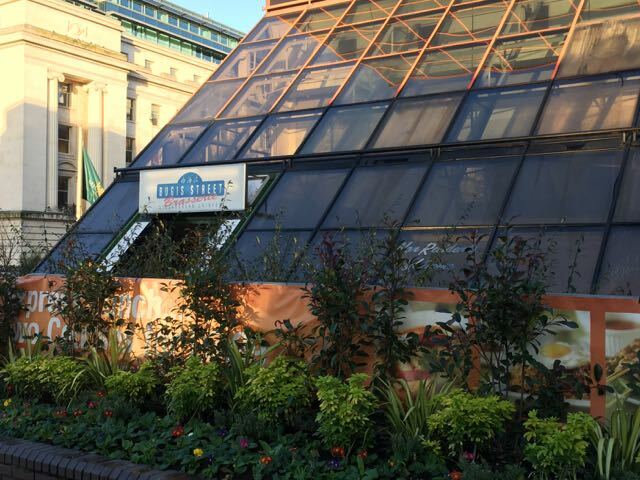 This entry was posted in Area: Broad Street, Area: Colmore Business District, Cuisine: Chinese, Cuisine: South East Asian, Cuisine: Thai, Price: Average, Venue type: Restaurant and tagged Birmingham Restaurant, birmingham restaurant review, birmingham review, eating out in birmingham, Out In Birmingham, out in brum, OutInBrum, restaurant review, where to eat in birmingham, Where To Go In Birmingham, where to go out in birmingham. Bookmark the permalink.